When Saudi Arabia led an OPEC decision to end a restraint put on oil production in November 2014, it marked the beginning of a new era in oil economics. It has given us a tumbling oil price, prompted huge losses and job cuts at oil firms like BP and might yet give us economic and political drama in the heart of Moscow. To understand why, it is worth drilling down to the start of the whole process, and the costs of getting oil out of the ground in the first place. Historically, the OPEC cartel of oil-producing nations has been able to manage oil prices because of the lack of flexibility in global supply. The whole business of setting up wells, operating pipelines and building rigs entails large and long-term investments, which makes producers slow to respond to price movements. In addition, a small cut in OPEC supply can have a significant impact on the global oil price. The advent of the US shale oil boom changed this dynamic. The industry has lower fixed costs but higher variable costs and is more like an industrial process than a major one-off investment. That makes it more responsive to price movements and more flexible in adjusting short-term output. Overall, though, shale is a relatively high cost source of oil, especially compared to Middle East production. As a result, when US shale threatened OPEC’s market share, the cartel allowed a position of global oversupply to develop. It was a simple trick: make oil prices fall to make shale unprofitable. 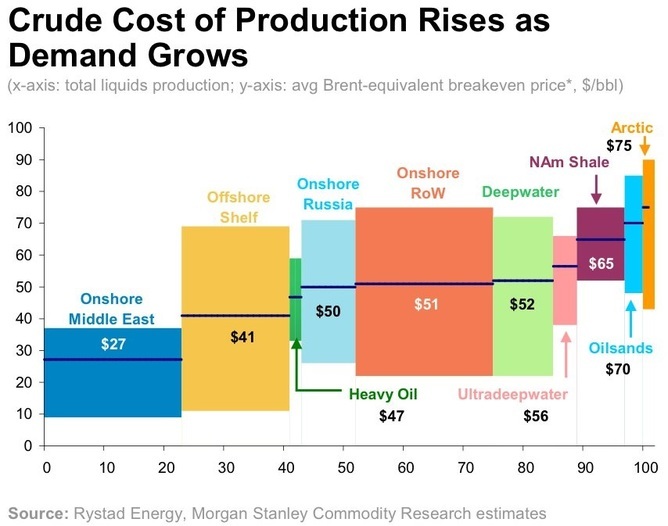 The chart below is a useful guide to how production costs stack up as production heads towards 100m barrels a day (which is pretty much where we are now). Focus on the blue square in the bottom left, which shows onshore Middle East production costs at as little as US$10 a barrel, while US shale (the purple block) can come in at more than US$70. The plan to cripple shale oil production has certainly had a significant effect. The price of benchmark Brent oil has fallen from a high of US$115 a barrel in mid-2014 to a low of US$27 in January 2016. However, the reaction of producers to this collapse, in particular in the shale fields of the US, has not been as dramatic as you might think; business has carried on. What is evident is that supply continues to outstrip demand and, according to the International Energy Agency, will carry on doing so throughout 2016, putting even more pressure on the oil price. So, why haven’t US producers been laid low given that the oil price has already fallen below the cost of shale oil production? There are a number of answers. The first is that many companies managed to hedge their production when prices were higher; selling future supplies of oil at a high enough price keep profits coming in. A second is that many got bank loans to pay for investment. 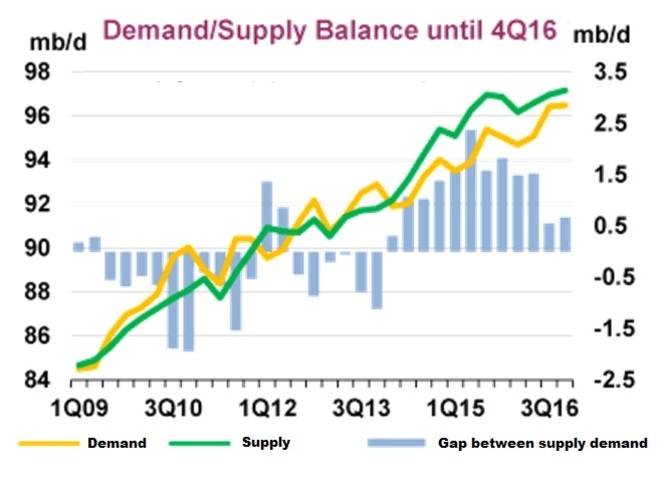 Loans need to be repaid, and so lower oil prices led to a need for higher output at almost any price. A third, and important reason, is that the cost of US shale production has decreased thanks to efficiency gains, a focus on the most productive regions and a drive to sharply reduce costs. In some regions, the cost of production has hit as low as US$30 a barrel. Low-cost producers have troubles of their own. Oil revenues are a major plank of many countries' budgets. Oil exports account for over 60% of export revenues, on average, for OPEC countries and account for as much as 90% of Saudi budget revenues. In Russia, they account for around half of total federal budget revenues and a similar amount of total exports. Any fall in prices can lead to both fiscal and budget deficits. 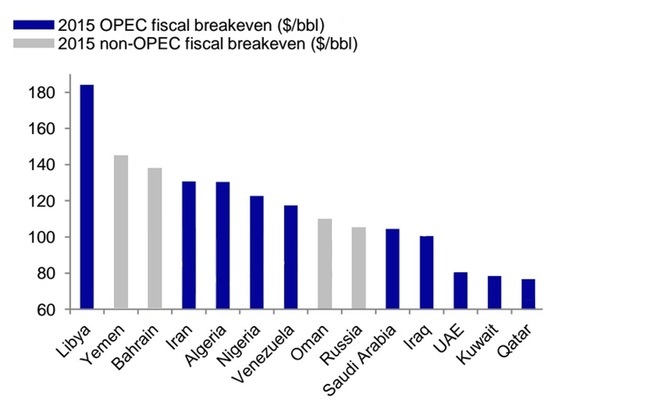 Time for another chart then, which shows the “fiscal breakeven” oil price per barrel for a variety of producers. The key observation is that all are above US$60 per barrel, with Saudi Arabia and Russia at around US$100. Despite this apparent pressure, the gap between breakeven and actual price can be sustained – at least for a while. Both Saudi Arabia and Russia have built up significant currency reserves during the period of high prices, which are now being used to finance a budget deficit and sustain spending. Russia though is reaching the limits of its reserves (at the current rate of spending the funds allocated to deal with a low oil price will be exhausted by early 2017). Currency devaluation is a blunt tool for Russia and others to consider, but it too can help by reducing costs in dollar terms. That said, a tipping point might now have been reached. The bankruptcy of US oil producers has begun as banks begin to call in loans, new financing gets harder to find and hedging programmes expire, leaving producers fully exposed to a lower oil price. Many OPEC countries have begun to despair that no end of the current oil price slump is in sight. And perhaps most interesting of all, it appears that Russia is becoming increasingly desperate to coordinate a production cut with OPEC, in stark contrast to its previous reluctance to engage with the cartel. It may just be, then, that a US$30 oil price has brought many producers to their knees, with the resulting possibility that the majority of OPEC countries, plus Russia and the US, may all be set to reduce output in 2016 and bring the oil market back into some form of balance. Only Saudi Arabia, with the largest financial reserves (about US$600 billion at the last count) and an avowed strategy to maintain market share, appears firm in its resolve to maintain production and brutally test the economic robustness of its major competitors.